Edita Food Industries was established in 1996 by the Berzi family and Chipita International (through Exoder Limited) and holds a leading market share in each of its five segments that span the Egyptian snack food market, including the cake, croissants, rusks (baked wheat), wafers, and candy segments. Today, Edita is one of the leading Fast Moving Consumer Goods (FMCG) companies in Egypt and the Middle East with c.6,200 employees and 128 stock-keeping units (SKUs). The company is well known for its consistently high quality products and strong brands including Molto, TODO, Bake Rolz, Bake Stix, Mimix, HoHo’s, Twinkies and Tiger Tail. Edita acts also as the sole regional distributor of several brands of imported sweeteners, olive oils, and pasta. Edita brands are a part of everyday life in Egypt and 16 other countries across the Middle East & North Africa. The driving force behind Edita’s success is the consistently high quality of its products. This quality is made possible by our application of the HACCP (Hazard Analysis and Critical Control Point) food management system, and reflected in our ISO 22000, ISO 9001, ISO 14001 and OHSAS 18001 certifications. Edita boasts five state-of-the-art production facilities, encompassing 29 production lines as of 9M2018. Three of our production facilities are located in 6th of October, one in 10th of Ramadan City and one in Beni Suef industrial zone to the south of Cairo. Each facility is managed by a plant manager who is fully responsible for meeting production plans while maintaining Edita’s high standards. A quality manager is also present in each facility. This department employs more than half of Edita’s 6,200 staff members. Edita inaugurated its new E08 factory in July 2017. The E08 facility is Edita’s fifth factory and is set to house 11 new lines, two of which have already been installed and are in commercial production, including the new wafer line (July 2017) and the new donut line (October 2017). The E08 facility will allow the company to expand its current product offering through launching new variants of existing products. E08 will also provide the space to fully capitalize on the company’s R&D capabilities and its new R&D center to continue rolling-out new innovative and differentiated offerings as part of Edita’s strategy to create new categories in the snack food market. Edita also places great importance on research and development activities, viewing innovation as a key pillar of its growth strategy going forward. Edita will continue to utilize its R&D capabilities to develop in-house offerings and complement its roadmap of launching new products for which technical know-how has been acquired from Hostess LLC. In that regard, the company has already brought online a new lab in the E07 factory with ongoing research on cost cutting possibilities given the flexibility and diversity of Edita’s inputs. Additionally, the R&D department plays a key role in Edita’s drive to localize some of its imported materials in order to reduce the company’s need for foreign currency, all while ensuring quality control. Products sold overseas averaged approximately 10% of the company’s total sales in 9M2018. Key export markets include Iraq and Palestine which together constituted 59.0% of total exports in FY2017. The company relies on local distributors for its export business and deals with them on a cash-in-advance basis given the high risk profile of many of its key export destinations. In Egypt, Edita’s extensive, streamlined and effective sales & distribution platform offers Edita an unmatched reach in the domestic market and includes a highly qualified, empowered and dedicated sales force of 1,124 employees including 532 sales representatives. The company delivers products from its 21 distribution centers spread across 27 governorates to more than 54,922 wholesale and retail customers via its 638 vehicles. Notably, high demand for Edita’s products allow to maintain a cash-based policy for 97% of its domestic sales despite the Egyptian market being predominately credit-based for the snacks industry. Looking ahead, Edita intends to focus on maintaining its relationships with existing customers while enhancing vertical and horizontal sales growth by working to increase order size and further developing its distribution capacity. The company aims to shift the current wholesale to retail ratio from 65:35 to an even 50:50 and thus maintaining better control and further enhancing its market feel. 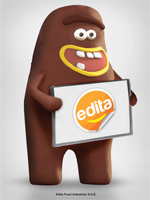 Edita’s vision and mission guide all of the company’s actions. Setting the benchmark of snacking with our high quality, innovative products. Together, spreading joy through trusted brands. Trust: We believe in Mutual Trust, we trust in our people; our biggest asset, and believe in their contribution to the growth of our organization and they in turn trust in our company to develop and nurture their potential to achieve their career goals. Responsibility: Responsibility towards our stakeholders and community as well as commitment to quality are pivotal to our strategy and operations. Innovation: Innovation is what defines and leads us as a company. Teamwork: Teamwork is core, we believe that the power of “We” is key to achieve our goals. Founded in 1996, Edita has capitalized on its strong reputation for quality and affordability to become the leading snack food company in Egypt. New Strudel line was commissioned in February 2016 and became fully operational by the end of the first quarter of the year. Edita acquires land in Sixth of October City’s Polaris Al-Zamil district, which falls in close proximity to its E07 plant, to build a new factory (E08). Edita introduces Dynamics Great Plains ERP (an ERP system integrating all business processes and providing business intelligence). Edita’s reputation for quality and affordability has led to the company commanding leading positions in all five of its market segments. 2013-2017 revenue CAGR of 11%. Egypt’s cake market is a relatively mature sector, accounting for c. 10% of the total snack foods market. The packaged croissants sector is the fastest-growing segment of Egypt’s snack foods market. It is a relatively young and concentrated market, with Edita’s Molto being the first branded product, introduced only in 1996. The salty snacks segment represents Egypt’s most frequently consumed snack food category, accounting for approximately 41.7% of all snacks consumption in the country, as well as being one of the industry’s most mature segments. Within the salty snacks market, Edita competes in the relatively smaller but fast-growing rusks segment. Through its Bake Family products, the company has managed to penetrate this market, characterized by having higher barriers to entry, through positioning the Bake Family as a baked product that is healthier than the traditional fried snacks. The Wafers segments has a high-growth profile due to frequent and high consumption patterns, although the segment currently contributes only 9% of the total snack foods market. Candies are Egypt’s slowest-growing snacks foods segment. This segment is highly fragmented, with c. 40% of the market captured by small players. * All figures are as at end 2017. Market data is from AC Nielsen; Brand awareness figures are from IPSOS. Edita’s supply chain is the lynchpin of the company’s operational model. In compliance with the highest international industry standards, Edita implements the internationally recognized Sales & Operational Planning process as it pertains to its supply chain, ensuring that planning, purchasing and logistics work streams are synchronized, streamlined and carried out in close coordination. The effort the company puts into production planning, purchasing and the integration of the distribution function into overall operations are key strengths that set Edita apart from our peers. The quality of materials determine the quality of our products, and Edita has a number of processes and policies in place to ensure that only the highest quality, freshest materials are used. Materials are sourced from both domestic and international suppliers, with 76% of all materials sourced locally, with the balance coming from suppliers from countries ranging from North America to Europe to the Middle East. All suppliers, both domestic and international, must adhere to Edita’s strict quality standards. For sourcing inputs, a key part of the company’s overall strategy is to avoid relying on a sole supplier to obtain raw materials so as to reduce any potential leverage a certain supplier might have on the company; whether in terms of pricing, quality or delivery. Likewise, the company seeks to keep supplies secure by working only with proven responsible and reliable suppliers. Edita boasts four state-of-the-art production facilities, encompassing 29 production lines. Three of our production facilities are located in 6th of October, one in 10th of Ramadan City and one in Beni Suef industrial zone to the south of Cairo. Each facility is managed by a plant manager who is fully responsible for meeting production plans while maintaining Edita’s high standards. A quality manager is also present in each facility. This department employs more than half of Edita’s 6,200 staff members. Our laboratories are among the most important areas within our facilities: We not only develop our market-leading products, but do so through the application of international-standard manufacturing practices to inspect, receive and handle ingredients as well as producing and handling finished products prior to going to market and performing continuous testing to guarantee shelf life. In April 2015, Edita acquired c. 55,000 square meters of land in 6th of October City’s Polaris Al-Zamil district, in close proximity to its E07 plant, to build a new factory. Inaugurated in July 2017 with the commissioning of its first production line and employing 22 workers, the new E08 factory will allow Edita the capacity to satisfy the increasing market and manufacture the new Hostess Brands products which it recently acquired. The E08 facility will be home to c.11 new production lines for the manufacture of Croissants, Cakes, Wafers, Rusks and Candy. Our specialist R&D department identifies new product opportunities based on consumer research and was instrumental in introducing new snack product categories in Egypt, including packaged croissants and rusks. Through the work of our R&D department at the laboratories, Edita has successfully introduced seven brands to the Egyptian market since 1997 and has coordinated 100 SKU launches and 40 SKU de-listings since 2010. Edita has an extensive, streamlined and effective distribution platform of 21 distribution centers covering 27 governorates, giving the company an unrivalled reach, allowing us to efficiently serve more than 66,800 direct retail and wholesale customers. This network offers Edita a solid underpinning for expansion. Last Trade 22/04/2019 10:25 AM Data delayed 15-20 min.